Like Cowper and Clare, Charlotte Smith elevated the ordinary details of the natural world into suitable subjects for poetry. She also helped to establish natural history, and poems about natural history, as suitable subjects for children See, for example, Harriet Ventum, Surveys of Nature (1802); John Aikin, The Calendar of Nature (1816); Mary Elliott, The Rambles of a Butterfly (1819) and The Sunflower, or Poetical Truths for Young Minds (1822). Smith’s poems often had a theological function: the wonders of the deity’s creation revealed the wonders of the creator. These poems, however, also set forth a strong sense of the interconnectedness of living things and of the poet’s ability to apply human categories to the nonhuman world. Smith’s poems remind us of a genre that was increasingly widespread by the time that William Blake was producing his own imitations (and perhaps parodies) of such lyrics: “The Lamb,” “The Tyger,” “The Fly,” “The Sick Rose.” According to Stuart Curran, Smith “was the first poet in England whom in retrospect we would call Romantic” (Poems xix-xxix. ). In her own prolific literary output, Smith links eighteenth-century ideas about the beauty and “sensibility” of nature to a more purely Romantic sense of the power and strangeness of a nonhuman world that is, by turns, both comforting and alienating. to their rude surface, clams, limpets, and mussels adhered, among the seaweed that grew streaming among them. All was wild, solitary and gloomy; the low murmur of the water formed a sort of accompaniment to the cries of the sand-piper, the puffin-awk; while the screaming gull, and the hoarse and heavy cormorant were heard, at intervals, still louder (2: 199). Smith’s first few novels also toyed with Gothic themes that Ann Radcliffe and others would later develop. However, she soon abandoned the worn castles and suffering heroines to explore political and social themes. As her writing changed and developed, it was clear that Smith’s style could not be easily classified as any one genre. Smith is an early example of a woman who sought to support herself by writing. She lived for seven months in debtors’ prison with her husband Benjamin Smith; this is where Smith wrote and published her first collection of poetry, Elegiac Sonnets. Sonnets had become synonymous with the style and form of the Shakespearean sonnet, but Smith brought originality to a form of poetry that had previously been very rigid. She achieved instant fame, and the money earned from the success of the book was enough to pay for the family’s release. She considered herself to be more of a poet than a novelist, although she published far more novels than collections of poetry. During this era, novels paid much better than poetry, but because poetry was still viewed as a higher art form than the novel, Smith identified herself as a poet. 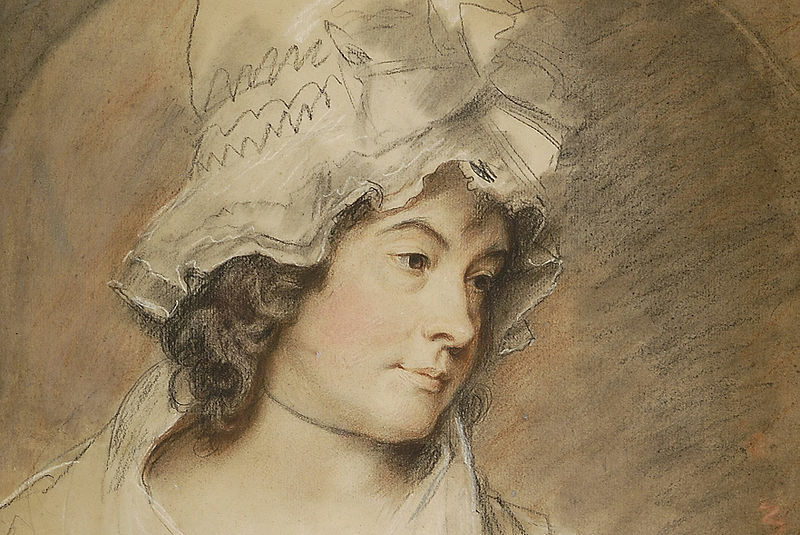 After leaving her husband in the 1790s, she was described by William Cowper: “Chain’d to her desk like a slave to his oar, with no other means of subsistence for herself and her numerous children” (To William Hayley, 29 January 1793). Though Smith was satisfied by publishing translations of French novels, it became necessary for her to write her own novels at the pace of one per year to support her family. Like Mary Wollstonecraft, Smith’s writing advocated for women’s rights. She disliked the courtship narratives that she felt restricted her as a female writer. She wrote about female suffering from her own perspective, the perspective of a woman who was truly suffering. Some of her beliefs stemmed from her own unhappy marriage; as a result, many of her novels were autobiographical. She faced further oppression once she and her husband were separated. Smith wanted control over her personal profits, but she knew that her money was likely to fall into the hands of her former husband, simply because of the gender-biased laws of her time. Smith expressed her anger on this subject by writing about heroines who struggled to overcome social inequality and men who wanted women to remain second-class citizens. She also voiced her support for the French Revolution in her writing, despite the fact that this revolution was then largely unpopular in England. Furthermore, Smith believed strongly in the abolition of slavery. She took many risks in her writing, such as signing all of her work in her own name, unusual for a woman, especially when she was just beginning to publish. Yet, once her success was established, Smith did not have to fear that her work would not be read simply because a woman’s name was on it. However, later in her life, her radical views on the French Revolution and women’s rights had a negative impact on her sales, and Smith had to tone down her rhetoric so that she could continue to support her family. Smith’s poems and prose works were praised by Coleridge, Godwin, Southey, Wordsworth, Leigh Hunt, and Jane Austen. Her novels included Emmeline (1788), Desmond (1792), and The Old Manor House (1793). Among her later works, she produced Rural Walks and Rambles Farther (both 1796), as well as Conversations Introducing Poetry, Chiefly on the Subjects of Natural History, for the Use of Young Persons, first published in 1804.